In college, my two best friends there Natalie and Flavia were both vegetarians and Thai is one of their favorite cuisines. They are the ones who introduced me to Thai food, and since then I've never looked back. Usually when I eat out, I get water to drink and maybe an appetizer to share on rare occasions. But every time I have Thai food, I'm sure to get spring rolls as an appetizer and thai iced tea to drink. After my birthday last month, I decided to see if I could replicate Thai-style iced tea at home (spring rolls, no - I'm not even going there). A lot of online research seemed to suggest I had to buy some sort of orange "Thai seasoning" powder from an Asian market. But I didn't give up, and my perseverance led me to SustainabiliTEA, the weblog of Arbor Teas, where I learned I could can make it by simply brewing strong black tea & adding sweetened condensed milk, sugar, and evaporated milk. I wouldn't go as far as to say it tastes just like you'd get at a restaurant - but it's pretty darn close, and I like the fact that I can use items readily available at any supermarket. And the best part is - I don't have to wait til next February to enjoy this yummy drink. Steep tea bags in boiling water for 5 minutes, then remove. Add sugar and sweetened condensed milk immediately, and stir to combine. Refrigerate until ready to serve. Add ice to 4 glasses, and pour tea mixture over ice. Top off each glass with evaporated milk, but do not stir - it should remain at the top of the glass as it's own layer. Serve immediately. Note: The color is not very orang-ey, so if you want to make it look more authentic you can add a little yellow and red food coloring to the mixture before refrigerating it. Thai is one of my favorite foods! I've made fresh rolls before but I can't seem to make a good peanut sauce. :( I think I'm going to have to give Thai ice tea a try! Thai is my favorite food too, and luckily my whole family love it too. I am a big fan of Thai tea so thanks for the recipe. i love thai food. spicy!! nway thanks for sharing the recipe. gonna try this tea soon. With the condensed milk it becomes more a dessert :) Yes, I have had this tea and I love it, but I say nothing beats a home brew ! I remember my first time having Thai iced tea and it was incredibly delicious. I couldn't get enough of it and think I ended up stuffing myself on it alone. It's a for sure thing I will order spring rolls and chicken green chile. I need to find a recipe for that still! I never put thought into making it at home so thank you for the idea! Yummy! generally actual thai tea does not need "thai seasoning" or food coloring. there is a loose leaf kind for thai tea that I have used to brew in the past that only needs sugar and half and half to mix. I'm not sure if the loose tea is available at all Asian markets but I got mine from a relative that co-owns a boba shop that makes thai tea. slightly similar to black tea but more fragrant as the loose tea prior to brewing smells exactly like brewed thai tea. I've never had Thai tea before but I am always a fan of new beverages! I can picture myself now sitting outside in the warm summer heat sipping this delightful tea. It looks so refreshing! I've never had this but I will surely try it! Yum! Wow - this looks soooo refreshing! This is PERFECT for my new weekly linky party - Foodie Friday! Everybody has linked up food but no drinky-poos! It won't be a party without refreshments! If you got a sec, please link up! I love Thai Iced Tea so much!! Maybe I'll make this tomorrow... Yummm! 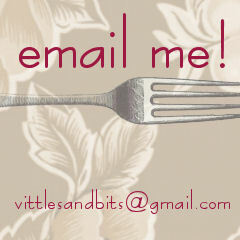 Happy Birthday, Vittles and Bits!